I’d like to talk about how you can set up your unity configuration file to resolve static references. This is handy depending of the context, for example you would like to register the Path Separator of the file system. This if you’re on unix-based system it’s more likely to be “/” and if you are on a Windows-based system it’s going to be “\”. Certainly you could use configuration files, for this purpose, this is just an alternative where you could let you application know about specific values without knowing they’re coming from, and you usually do this for test-ability. I’d like to set my Unity Container to take the value from a static field, so I do not have to write code to set up a the container in code and in the configuration file. Unity Container is very flexible and moreover extensible. It takes advantage of a pattern called “TypeConverter”, which basically it’s an specialized class which maps from one type to another. Particularly in our case we will be mapping from System.string value to any valid static value by using reflection. /// Converts an (formatted) string to a reference of a given static member. Simple ;-). Finally we only have to use our container as we usually use it. In my case I’ve some extensions to load and configure the container, you can check them by downloading the source code. Today I have an idea for an application using all “modern” (formerly Metro). As part of this idea I needed a Life tile. I look quickly into the SDK but not found a reference of how any hub tile control built-in in WinRT SDK. Thus my second idea was to import one already done in Windows Phone Toolkit. This last approach worked smoothly. In my example I’m using code decompiled by dotTrace, but since Windows Phone Toolkit is open source you can go to codeplex side and download it. 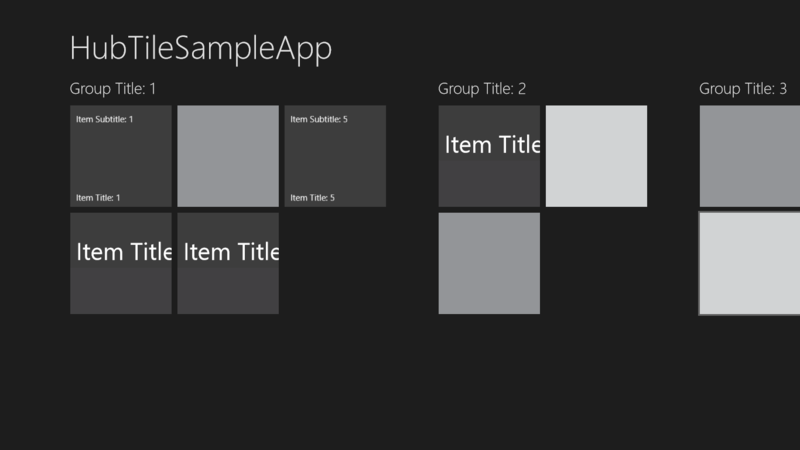 I want to include hub tiles (life tiles) into my Modern (Metro/WinRT) application. Import the HubTile control from the Windows Phone toolkit at http://silverlight.codeplex.com/releases/view/60291 and import this control to WinRT. In reality I decompiled the code instead of importing it, but it would have been easier to download it. In any case my example is using decompile code, and it’s based on the Grid Template. There is not much work behind it, only decompile, copy, paste and compile. There were few changes, but they’re not worth to mention. That said, here is the control, and I hope you can have some fun with it.